A new earthquake struck Sulawesi Island, about 1,500 km from Jakarta, Indonesia on Tuesday morning, October 9, 2018. The earthquake, which measured 5.1 on the Richter scale, visited Indonesia less than 10 days from the 7.5 magnitude earthquake and tsunami, which displaced 74,000 people and resulted in nearly 2,000 deaths while more than 260 people are still missing, according to the Indonesian National Board for Disaster Management (BNPB). There were no immediate reports of damage or destruction, the German news agency DPA reported. After the earthquake, the Pacific Tsunami Warning Center did not issue a tsunami warning, however, the status affiliated with Central Sulawesi area have changed to “SOS Alert”. 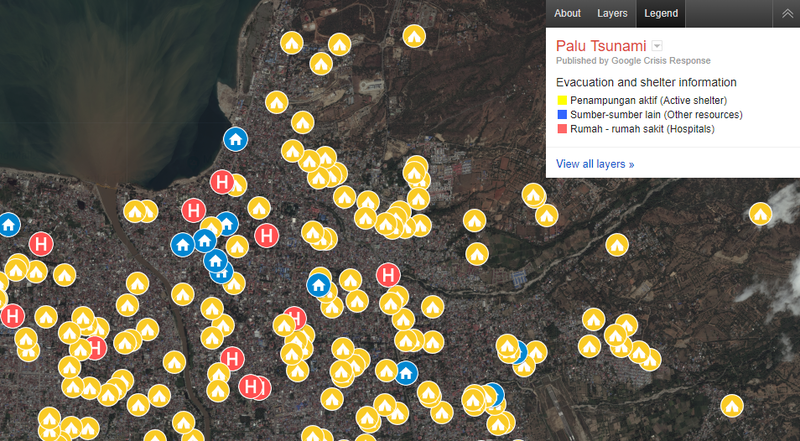 Google Crisis Response published a dedicated section to Sulawesi with an interactive map of evacuation and shelter locations within three sections: Active shelter, other resources, and hospitals.